cf. city flows A comparative visualization of urban bike mobility. Three high-resolution screens show the space of flows of New York, Berlin, and London through visualizing bike sharing systems of these world cities. By showing the flow of multiple cities side by side, we can compare their extent and dynamics. It also enables us to observe and dwell on similarities and differences in various bike-sharing systems. With our visualizations we want to understand the pulse of urban mobility, and create portraits of a city defined by its transient dynamics. Cycling is increasingly recognized as critical component of future urban mobility. Riding a bike is largely independent of other traffic and unaffected by road congestion, and has health and environmental benefits. In the last few years, many cities around the world installed bike-sharing systems in order to attract casual use of bicycles for locals and visitors alike. cf. 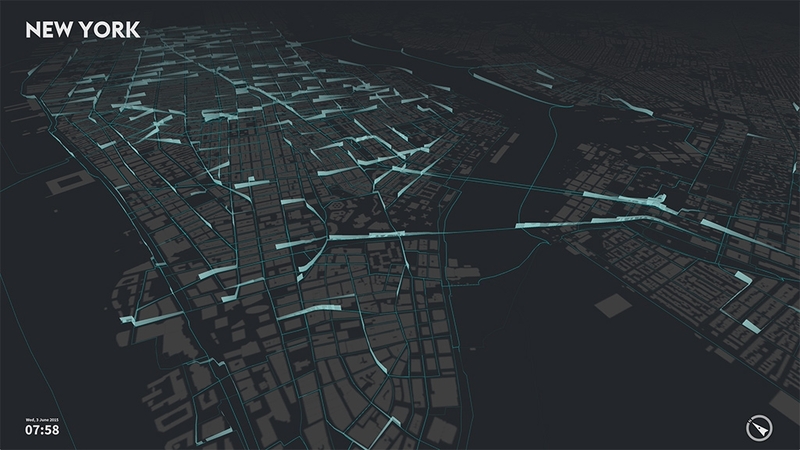 city flows is a comparative visualization of urban bike movements. High resolution screens show the space of flows of three global cities through visualizing aspects of their bike sharing systems. cf. city flows has two viewing modes. In the main one, we visualize trajectories of bike ride. Tracing urban movements accentuates different urban structures, and contrasts grid-plan cities like New York with historically grown cities such as Berlin. We show characteristic fingerprints of selected bike stations in the secondary view. After the map and all other trails fade away, the selected stations show their journeys as small glyph. It then explodes into morning and evening, and into incoming and outgoing journeys, resulting in a small multiple of four glyphs for each station. This can reveal tempo-spatial mobility patterns, such as commuters arriving to an office district in the morning, and leaving the area in the evening. We aimed to design our system in a highly aesthetic style in order to attract visitors in a semi-public space such as an exhibition area. Multiple cities are shown side by side to allow comparison with the each other. The views of all three cities are coordinated, and show the same time of day, and have the same map scale. Visitors from one of the shown cities can relate and compare known stations and areas with similar ones from other cities. 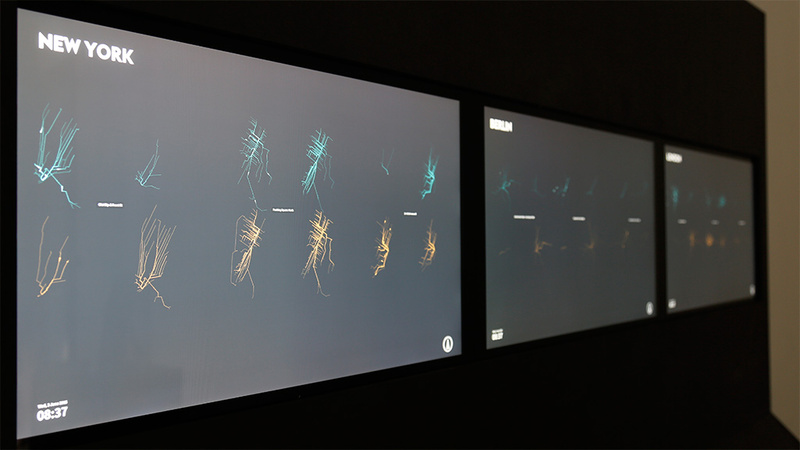 Our installation visualizes the flows and the relations within and between urban districts. It supports comparing one city with others, which can help citizens to become better informed and demand a greater system. In this sense, depicting the current state can help reflecting on how a future system should be. We believe that geovisualizations can empower citizens to make sense of the invisible layers in their environment, and help people to better participate in the creation of a smart and sustainable city. 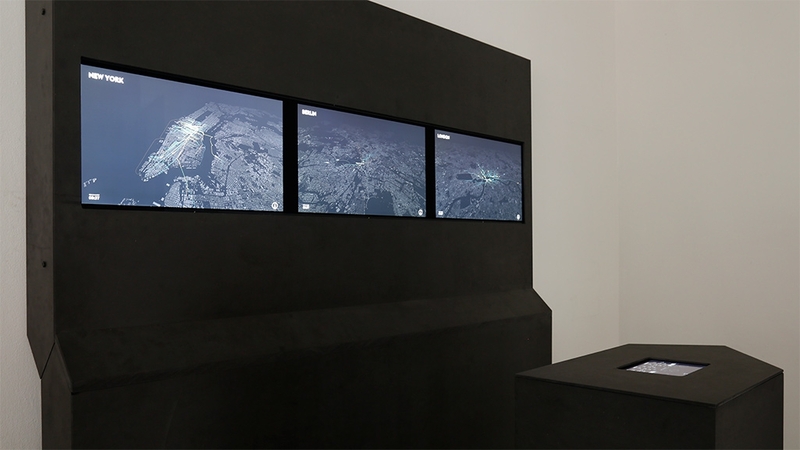 In this paper we examine the concept of staged analysis through a case study on visualizing urban mobility exhibited in a public gallery space. Recently, many cities introduced bike-sharing in order to promote cycling among locals and visitors. We explore how citizens can be guided from evocative impressions of bicycling flows to comparative analysis of three bike-sharing systems. 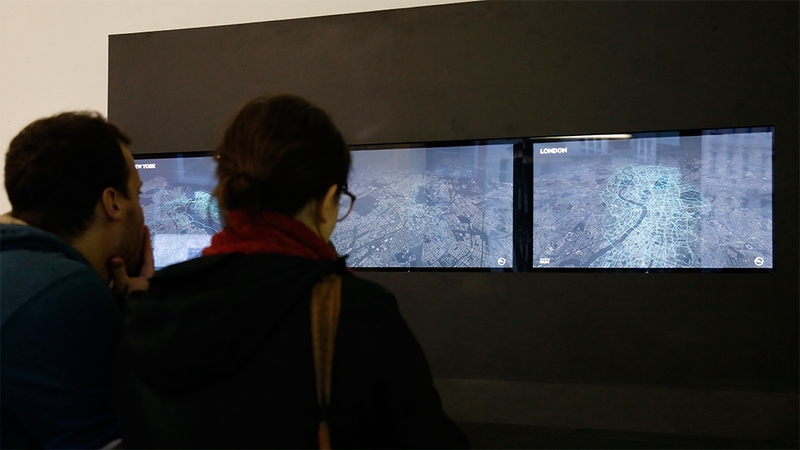 The main aim for visualizations in exhibition contexts is to encourage a shift from temporary interest to deeper insight into a complex phenomenon. To pursue this ambition we introduce cf. city flows, a comparative visualization environment of urban bike mobility designed to help citizens casually analyze three bike-sharing systems in the context of a public exhibition space. Multiple large screens show the space of flows in bike-sharing for three selected world cities: Berlin, London, and New York. Bike journeys are represented in three geospatial visualizations designed to be progressively more analytical, from animated trails to small-multiple glyphs. In this paper, we describe our design concept and process, the exhibition setup, and discuss some of the insights visitors gained while interacting with the visualizations.